More than 50,000 acres of public hunting lands are available within fifteen miles of Durand, the county seat. Remote river bottoms, rugged bluffs and hillsides present a tough challenge to the most experienced hunter. For deer and duck, Pepin County is one of the state’s best; turkey and grouse are plentiful. Rabbits, squirrels, raccoons, muskrat, beaver and fox are also abundant. Black bear also can be found in Pepin County. Fish are very abundant in Pepin County. The fast-moving Chippewa River, and the quiet, but deep, Lake Pepin are habitat to more than a dozen species of large and small game fish including northern pike, walleye small and large mouth bass, pan fish, trout and catfish. Local outfitters provide tackle and bait, boats, motors and up-to-date information about fishing conditions. Pepin County is the birthplace of Laura Ingalls Wilder and the settling for “Little House in The Big Woods”, the first of her internationally acclaimed chronicles of growing up in young America. The people of Pepin county remember and pay tribute to their most famous daughter with a reconstruction of the log house Charles “Pa” Ingalls built in 1863 and where Laura was born in 1867. Her life is remember also at the Pepin Historical Laura Ingalls Wilder Museum; and at the annual “Laura Ingalls Wilder Days” festival where “Little House” fans from around the world gather on the second full weekend in September to visit her birthplace and share their enjoyment of her work. The areas historic past is also remembered and preserved in vintage buildings rising from the river to the bluffs of picturesque frontier river towns. Museums and 19th century bed and breakfast inns, railroad depots and commercial buildings, on the sites of 17th century fur-trading posts, capture the feel of the historic past. There are also historic frontier day re-enactments, great riverboats with steam calliopes “whistling” their arrival and departure. Old World churches built by 19th century immigrants, 100 year-old round barns, horse-powered transportation, 19th century farming practices, lantern-lighted windows, traditional dress and customs of the county’s Amish communities. Pepin County’s wildflowers are as numerous and diverse as the County’s varied physical characteristics. Amateur nature lovers and naturalists who explore the area’s uplands and lowlands, open prairies and deep, wooded ravines, sharp bluffs and river bottom habitats delight in discovering yellow ladyslipper, trillium, showy orchids, maidenhair fern, pasque flower, blazing star, blue-eyed grass and hundreds of other varieties of spectacular, delicate and rare species of wildflowers and the equally delicate, unusual and rare beetles and butterflies attracted to them. Outdoor enthusiast are offered many different recreational opportunities in Pepin County, including cycling the rolling hills, forests and prairies, hiking, snowmobiling, ATV riding, snowshoeing and skiing through fairytale gorges, across open prairies, along lakes, rivers and streams provide miles and miles of canoeing and kayaking, from lazily drifting, easy paddling beginners’ routes to the more challenging, rushing waters of the Chippewa River. Lake Pepin invites sailors, power boaters and float boat captains as well as kayakers, sailboarders and canoes to join the eagles and egrets on its waters; and swimmers are never far from refreshing waters anywhere in the county. Pepin County’s art galleries, antique shops, specialty gift and collectible boutiques delight browsers and reward serious treasure hunters with unexpected “finds” from Native American artifacts to contemporary gifts and artworks. Several Amish communities invite backcountry travelers to browse and sample their handmade furniture, quilts, handcrafts and baked goods. When it comes to dining, “Pepin County has a personality all its own including culinary experiences that rival big cities” the Milwaukee Journal informed it readers. Pepin county’s restuarants, bars, cafes, delis, coffee houses, bed and breakfast inns, dining rooms and fast food outlets feature a wide range of foods served in a variety of settings. Diners can choose from fine Italian, Norwegian, Continental, Classic American and Frontier Style Cuisine served in historic 19th Century settings, river front dining rooms, authentic Old World cafes and excursion boats. For casual meals, area fast food outlets, coffee houses, taverns and bars offer carry-out or eat-in pub burgers and fries, Mexican specialties, mad-to-order sandwiches, pastries hot from the oven and desserts to tempt the most discerning palate. Pepin County travelers also enjoy a broad range of lodging accommodations, including semi-wilderness campsites in the Tiffany Wildlife Area, full service RV Resort campgrounds, housekeeping resort cottages, luxurious 19th century bed and breakfast inns, a 19th century hotel and contemporary, full service and economy hotels and motels. The visual experience of traveling along the Wisconsin Great River Road is why the entire 250-mile route was voted Prettiest Drive: Ultimate Summer Road Trip In The United States. The Mississippi River and its backwaters flanked by sandstone bluffs standing over 500 feet tall with the Great River Road winding between make for scenic opportunities around every curve. Sand prairies offer expansive views. River valleys from the many rivers of Wisconsin feeding into the Mississippi River offer beautiful views. The Great River Road runs through the Driftless Area from where the Chippewa River joins the Mississippi River down to the border with Illinois. This area is known mainly for its deep carved river valleys and remain today for our viewing pleasure because it was not covered by glaciers during the last ice age. This week WCCO news ‘going to the lake’ series features the Lake Pepin area. 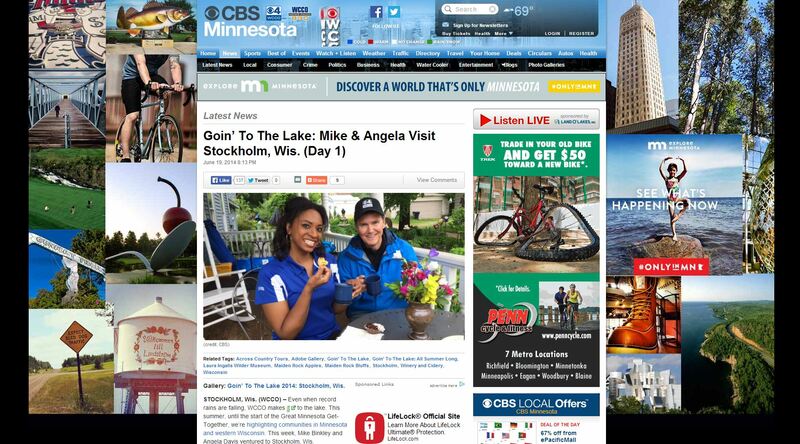 The last few days WCCO has been exploring Maiden Rock, Stockholm, and Pepin. They have been doing an excellent job showcasing the galleries, restaurants, and natural beauty that make Lake Pepin a great place to visit. Click the links to check out all the great videos.